Stranded in Chicago: This is about a book. I'm not lying and that's not a metaphor. Twenty Thousand Leagues Under the Sea by Jules Verne. I wish I could give you a fun fact about the author or something, but I have nothing that pertains floating (haha!) in the vault of useless trivia in my head. But so much adventure! Plus, I read it so long ago that I no longer remember what happens at the end, so it's almost like I'm reading it for the first time again. 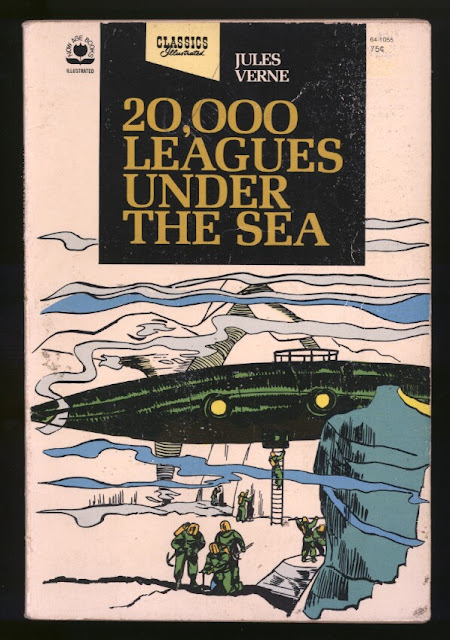 Sure, there's some technical mumbo-jumbo on behalf of the narrator, but I mostly skim over those parts since understanding the physics of a submarine isn't actually necessary in understanding the plot. Are there any classic novels you like to revisit now and again? Another favorite (although I do always remember what happens in this one) is Wuthering Heights, with all that unrequited love and such. Great classic and should be read by all. Good choice sweetie! I loved this book so much. When I was a small girl I read all of Jules Verne one after an other. wish i had time to read :) when i traveled i read a lot! jane eyre always! and the new movie's coming out, i have high expectations- it better be good!! I am a huge Jane Austen fan, Sense & Sensibility (while somewhat cliche) is a classic that I could re-read a million times. Do you have a kindle? Do you love it? I don't know what it is, but I just couldn't get into Jane Austen. I might give it another try in a year or so, I like to do that periodically. I actually was lucky enough to be given an iPad this Christmas, so I have the Kindle app, but it's soooo gooood for the plane I can't even tell you. Weather in the windy city is about the same as always, supposed to be some fun rain/snow mix tomorrow. Sigh. Maybe your forecast is just an April Fools' joke?